MAGIC SPIKERS Training Program will be offered this Summer, and will be held at the Round Rock Sports Center. This is a great program designed to help develop your skills in the off season. It's perfect for players that are ready to move on from the local rec programs, and for the multi-sport athletes that would like to grow in the sport but cannot commit to a full season of club!! This developmental program will help you build a strong foundation of volleyball fundamentals, as well as fine tune your existing skills. These sessions will be 1.5 hour sessions once a week. Training sessions will be done by Madeline Kazmann and led by Magic Volleyball Club Coaches. Who: Girls will have 2 age groups. 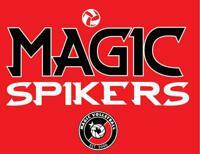 Magic Spikers – Summer Session will consist of 6 sessions over 6 weeks.